On my local Chinese buffet there are some sweet potato rolls that are to die for. I was just wondering if this was traditional Chinese food? I think sweet potato roll is western food, it's some type of bread still. And I never saw it in China. I have never had these before. Jamie what are they like or how are they made? I love sweet potatoes and would not mind trying them. Do you have a good recipe for sweet potato rolls? This seems like something I would want to enjoy from my own kitchen. And, homemade is always best anyway. Authentic Chinese cuisine is going to look and taste different than the Americanized version- like these . 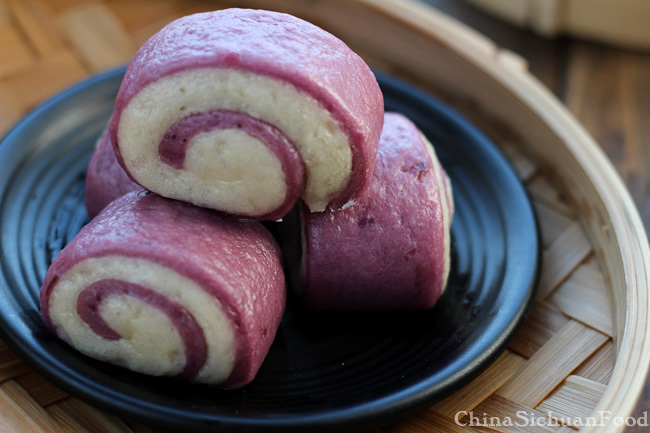 purple sweet potato buns. Not a typical American dinner roll.